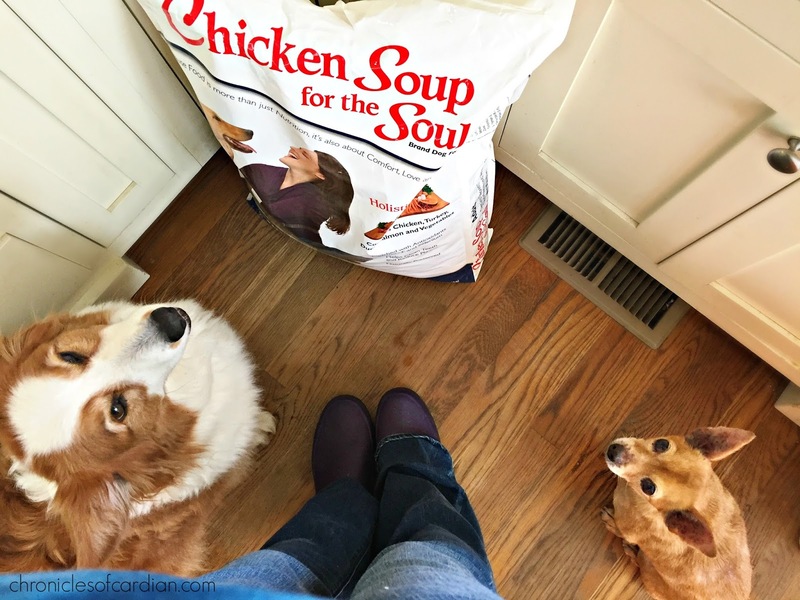 Addendum to the disclosure: I mentioned in my previous Chicken Soup for the Soul® Brand Pet Food post that I've been feeding the brand to my pets for 47 years (OK six, which is a long time in dog years), and that it warms my soul to know they're eating wholesome food that leaves them looking and feeling great. My point is--since the food is a no-brainer, and I had so much fun tackling the #LoveYourPetEveryDay subject--frankly, getting a nod from the brand to write this post felt like a Leprechaun's rainbow shot out of the sky and smacked me upside my head--in a good way. I hope you have as much fun reading as I did writing! My foster dog, Leona Lilly, aka Lele, a 10-year-old chihuahua, has yeasty ears that require daily flushing with medicated ear drops. Despite my warming the bottle to match her ear temperature, and singing of soothing, sing-song-y songs with made up words, when she sees me pick up the bottle, she turns tail and sprints in the other direction. It doesn't matter how many times I tell her I'm only doing it "for her own good," because I love her. She thinks the ear drops are evil and that I am their steward. Thank dog she can't talk; I'm pretty sure she'd make my oft-surly teenagers look like D.J. Tanner wannabes in comparison. Lele Chihuahua: "I'll take the iPhone camera over the ear drops, but could'ya get a move on with dinner?" Jon Farleigh: "I have some fuzz in my eye." No, they don't get any. Not even the speck that fell off my cookie crisp knockoff cereal, or the streak of ice cream that I missed when I licked the bowl. Not even when they stare at me with giant cow eyes. Because I love them, they will literally never experience death by chocolate. Tether dog by the neck and/or chest to my wrist at all times while outside. We don't have a fenced yard, so the dogs get attached to my wrist by a six-foot strip of industrial strength nylon webbing. They go only where I go. Because I love them, they will stay out of trouble in the great outdoors. Orange tabby cat-proof the kitchen faucet with a rubber band bungee. Bobby Flay O'Fish is obsessed with turning on the levered kitchen faucet with his muzzle. It was cheaper to clamp the lever to the faucet with a giant blue rubber band than replace the faucet with something less cat-friendly. Bobby will not go thirsty. Because I love him, I prevent him from turning on the water full blast when no one is home (or awake) and wasting water, flooding the kitchen and running our water bill over Mt. Everest. Orange tabby cats fare better when their people are not mopping up floods and flat broke. Limit meal size to one healthy serving, vs. a Golden Corral-sized smorgasbord of all-you-can-eat everything-under-the-sun that is edible. I know the delicacies lurking behind you, pantry door. 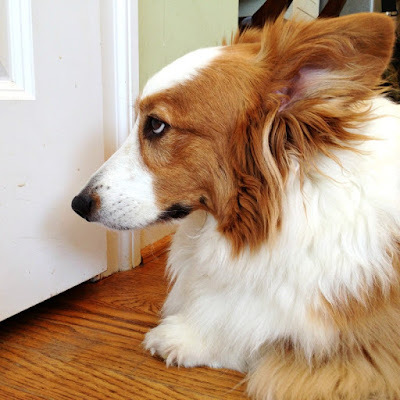 I could open the pantry and refrigerator/freezer doors and let the dogs help themselves to whatever they want, whenever they want (which would be all the waking hours, and all the food, except for pretzels, sour apples, and pecans--the only things the dogs have ever NOT eaten when offered). But I don't. It doesn't matter that they finish before I've had time to walk a full lap of the kitchen, or that they bore holes in my face with their pleading eyes. Because I love them, I give them one measured serving per meal of a wholesome, natural kibble (such as the new Chicken Soup for the Soul Grain Free Salmon, Sweet Potato & Pea recipe for dogs**), topped with a dollop of a wholesome, natural wet food. Corgis and foster chihuahuas with defined waistlines (vs. puffer fish middles) are much less prone to injuring themselves getting on the couch for snuggles, among other important health risks. Now see? It's no wonder my pets think I'm a clod. Except, wait. That's a short list, relatively speaking. If I made a similar list of all the easy ways I love them every day (because they ROCK)--like, for example, talking to them, smooching their heads, rubbing their bellies, scratching their chins/ears/backs/butts, feeding them regularly so they don't go hungry, keeping them warm/cool/dry, giving them soft, snugly places to rest their bones, giving them treats (even bacon, sometimes), playing with them, providing toys and exercise, making them sit for cute pictures to display proudly on social media, and giving them supervised time outside in the fresh air--it would be WAY longer. A clod? I think not! * I eat something with cocoa in it every day, because I love myself. ** Lele the foster chihuahua has more than yeasty ears, she has irritated, yeasty skin and is losing patches of hair. In case it is related to food allergies, I've switched her to the new Chicken Soup Grain Free Salmon recipe, which not only contains a novel protein to her, but also novel carb sources. All of my appendages are crossed that it clears up her issues! Thank you, Chicken Soup for the Soul, for helping me sort this daily pet-love thing out! Thanks, too, for the awesome nourishment you've been making for my awesome pets over the years! Wanna serve some Chicken Soup for the Soul food to your awesome pet? Find your nearest retailer here. You'll also find the brand at major online retailers. Is your pet your hero? Don't forget to enter Chicken Soup for the Soul's Show Us Your Hero pet contest! You could win an appearance on the CBS Saturday morning lineup show Hidden Heroes or in an upcoming book! Love a pet food company that's committed to giving back to pets? Check this out! A portion of proceeds from the sale of Chicken Soup for the Soul pet food is donated to The Humpty Dumpty Institute, helping support organizations that feed and care for animals in shelters. Royalties from the sale of the new books, Chicken Soup for the Soul: My Very Good, Very Bad Dog, and Chicken Soup for the Soul: My Very Good, Very Bad Cat will be donated to the American Humane Association. Chicken Soup for the Soul is the official Dog Food Sponsor of the American Humane Association's Hero Dog Awards, including, more specifically, the Therapy Dog category. 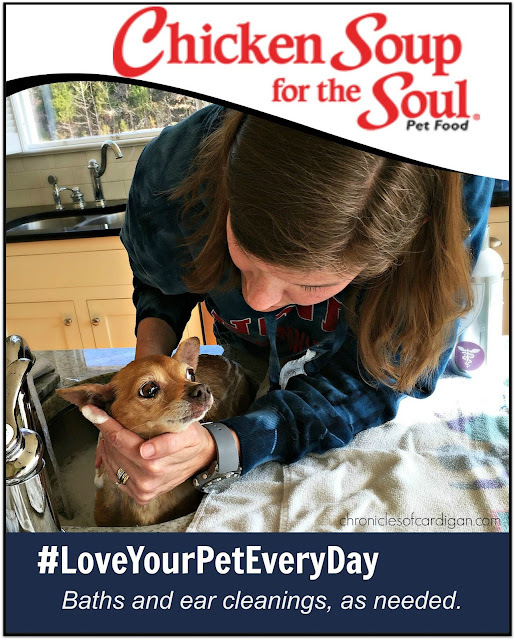 Local shelter pets (including some who've found their forever homes) are featured on every package of Chicken Soup for the Soul brand pet food. For the latest news, deals and of course, Chicken Soup for the Soul-warming pet stories, be sure to follow the brand on social media. Mr. N agrees with most of my decisions but he definitely thinks I should be with him 24/7 and I should go let him chase the pony. Great article - we enjoyed learning how you show love to your fuzzy family members! We love that you take in fosters, bless your heart! I'm always amazed at how cats love to play with water.... they are such sweet little critters! What a great post! You definitely are a hero! I hope that Lele's ears clear up soon. It can be hard to be the "mean one" who doesn't give in to the puppy eyes, but it is worth it when their health is on the line. Love the orange tabby - and the rubber band is a great idea to cat-proof the kitchen faucet and prevent flooding to your kitchen. Charlie too likes to drink from the bathroom tap, but luckily he demands I turn it on for him. The Humpty Dumpty Institute is very special! What a great brand -- and I also tether my youngest dog, Walter, to my waist on says I cannot trust him! I'm not sure if Keira thinks I'm her hero, but boy is she ever mine. If it wasn't for her I would not have gotten past the death of both my parents. She was my rock. It might sound strange to some but it's so true. I enjoyed your post a ton! Aww hope the ears get better. Loving your pet every day is awesome. I sure love Simba every day! I absolutely love this article, you made me laugh/smile while promoting a product. Loving you pet every day is the way to go!! They certainly make my life better!! Ok this was just fantastic!!! You always make me laugh but great points. I adore Kilo and do sneak him treats. He is very healthy and happy, if a little complicated. He eats grain free high protein kibble rotated. This was an awesome post. How true, what we have to do to love and care for our pets. How we have to sometimes chase them down to do something they consider awful...because we love them. Not giving them stuff even when the sad puppy dog eyes are sooooo very sad...because we love them. How does it go.... If loving you is wrong I don't want to be right. We do what it takes to love our pets even though it may not be their favorite thing. Thanks for such a fun and interesting post. You hit the nail on the head. I love how giving and forgiving our pets are with us. Such a wonderful look at our furry friends and what they think of us. We love how Bobby Flay O'Fish kept turning on the faucet. We know we are loved each and every day. Our wish is that every dog and cat could get the same kind of forever home and human that we have. There are so many ways I show my pets love... I think though that every morning it starts when I feed them. I love making their meals and watching them enjoy it sooo much... Then we just spend great days together, and there is nothing like cuddling for an afternoon nap! I'm sure they do know we do these things out of love. Great cat in sink video! This food sounds great, my dogs love salmon & sweet potato, and I like the grain free aspect. I spoil the crap out of my dogs every day, they deserve it! I sure hope they don't think I'm a clod. You're right - you do have to stand up to your pets' "wants" sometimes for their own good. I love the video of Bobby turning on the sink! I'm sure my Cinco would do that too if we have handles like that on our sink. He loves to open all of the cupboards in the kitchen for no other reason than liking to have them open. I love the heart of the Chicken Soup for the Soul company. We haven't tried the food, but I bet it is great!